Aerosol spray. Active ingredients are: DEET 25%. 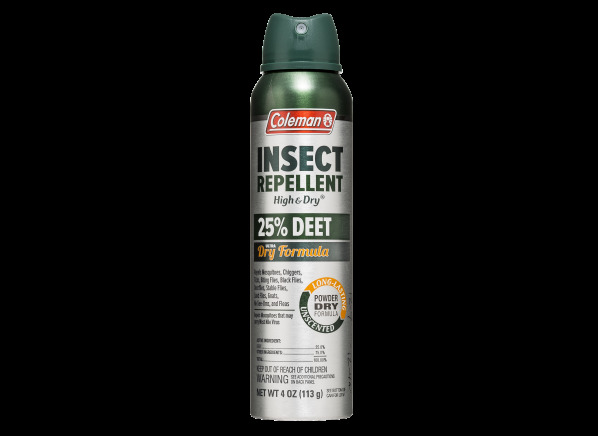 The Coleman Insect Repellent High & Dry 25% DEET is part of the Insect repellent test program at Consumer Reports. In our lab tests, Insect repellent models like the Insect Repellent High & Dry 25% DEET are rated on multiple criteria, such as those listed below. Cost per oz. : For aerosol or pump sprays and lotions, the approximate retail price divided by product contents in ounces. For wipes or towelettes, the approximate retail price divided by product content in ounces; see Cost per wipe ($) for price per wipe. Protection against mosquitoes and ticks: Each product is tested to see how effectively it protects against Aedes mosquitoes (the aggressive mosquitoes that tend to bite during the day and can spread Zika) and Culex mosquitoes (nighttime biters that can spread West Nile). Based on our past testing, and on advice from independent experts, products that are effective against mosquitoes should be effective against other arthropods, including deer ticks. Resists damage to materials: We test repellents on several common materials. Those scoring higher are less likely to cause damage. If you are concerned about damage, test first on an inconspicuous spot.